Looking for a good at home spray on bed liner kit that is tintable to the factory color of the truck, which in this case is russet brown metallic. What would you recommend? Re: What DIY tintable bed liner? Raptor Liner U-pol is great stuff. It is tintable any color and lays down decent. This jeep was painted with it. It is also lined on the inside with black. Thanks! So far I have gotten recommendations for raptor and liner extreme. The subject has been bantered about in several threads. You might want to take a look. People who blindly follow a GPS end up on television programs on The Weather Channel. Some survive, some don't. What's the intended purpose? If its for your bed and you plan to actually use the bed for something other than carrying a truck cover or comfy chair for shows don't waste your money. Have one sprayed professionally then get paint for it. Tinted real bedliner can be done but its real $$$, it comes in black then buy the base and clear along with Bulldog Adhesion Promoter and spray away. Interesting. Have you used it yourself? I just wonder why it would be no good? I was going to use Raptor Liner for the inside of my Suburban, but the paint guy recommended a product called Liner Extreme. He sold both, but recommended that one. He said it was cheaper, gets more coverage and in his opinion better. I will be spraying it on my father in laws truck bed today, so will get to see first hand before I use it. I will report back on how it turns out. The paint guy said he could make in any color you wanted, just give him a paint code. I got black. That's the other one I have been recommended also. We sprayed today. It was pretty easy to do. We used a texture hopper per the paint guys recommendations. We used one gallon, which covered the whole bed, but there are some areas that will need some touch ups. We will probably do another gallon when I go to spray the inside of my Suburban. I paid $115 for the one gallon at a swap meet. Here are some photos. Nice! Was that fine or heavy crumb? I used the smallest nozzle on my hopper. The texture in the photo looks heavier in the photo than it is in person. Probably due to it still being really shiny. Well it looks good! Can you give a feedback report on it in a week or so after it fully cures? Fake bedliner cant take the abuse thrown at it like Rhino or Ultimate Liners can. I spray Ultimate and its mixed 1 to 1, heated to 150 degrees and sprayed at 2700psi and dries within seconds. Now as to why its stronger, its poly urea based. The poly is the gripping action like when you set something heavy in the bed and it doesn't move. The urea is the toughness and together its makeup is similar to skateboard wheels. Sure , no problem. I'll post a status up next or so, after the next time I see the truck. We did father in laws, not mine. Here is an update on the Liner Xtreeme product. I saw the truck for the first time since spraying yesterday. It was nice and hard. Felt really solid. It was a little rougher than I would prefer, but that could be because of our hopper that we used to spray it with. It is a nice dark black color and still has a slight gloss look to it. Overall it turned out pretty well. 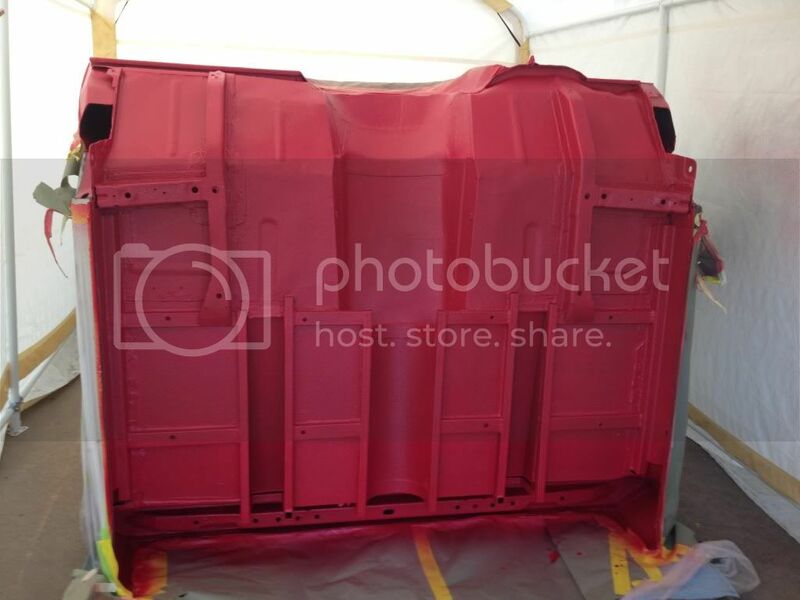 We need to do another coat because you can still see a little red coming through in spots, so we might try to thin it down a little more for the second coat to make it a little smoother finish once we are completely done. I thinned it down a bit with acetone and it went down real smooth. A bit lumpy like most Rhino, not rough or dry to the touch but still bumpy. I've used u-pol raptor and its a great product for covering but not as a real bedliner formula like line-x. It wasn't as thick as line-x but it was close, and its tintable. What I'm wondering is: How much of a pain in the arse is it to remove it? Removing most any kind of liner is quite a problem....a sandblaster worked 8hrs removing it from my bed.. I wonder if there is any chemical means to remove that stuff? What kind of marketing BS is this? The term polyurea actually means it is a crosslinked polymer chain of urea molecules. The gripping action comes from the fact that it is an elastomer, meaning that it can recover from repeated deformations, and the strength and toughness come from the fact that polyurea is typically around 6000 psi tensile strength. Also, skateboard wheels are made of polyurethane.